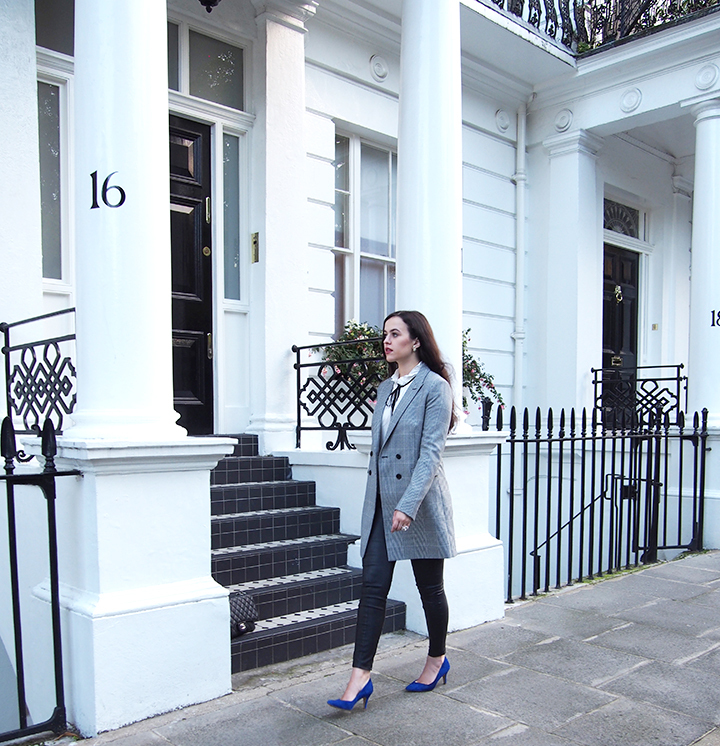 Arabella: Reiss Tailored Jacket and Frilly Collar - Mixing Old and New Pieces. Reiss Tailored Jacket and Frilly Collar - Mixing Old and New Pieces. When it comes to style and dressing myself, I don't place a huge amount of importance on having new things. I don't believe that in order to look good or 'current' every component of an outfit must be new, because honestly I don't think that's a sustainable way to live or a particularly healthy thing to promote. I don't really care if something is last season or 2 years old - if I still like it, I'll wear it. 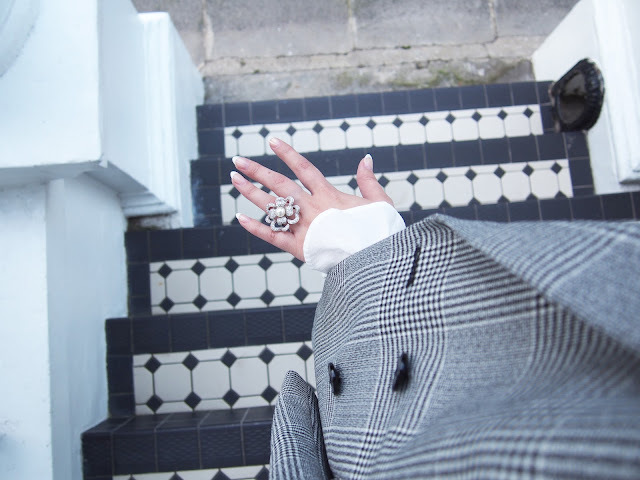 So with this post, I'm presenting a perfect example of how I love to mix old clothes with new ones, similarly to how I enjoy mixing 'designer' accessories with high-street pieces. I wore this outfit to the final day of London Fashion Week a couple of weeks ago but never got around to photographing it on the day. The jacket and blouse, from Reiss and M&S respectively, I picked up in the last few weeks. However, the shoes are about 2 years old and I've featured them numerous times. They're perfectly comfortable and add some vibrancy to an otherwise monochrome outfit. Now, the trousers are at least 3 years old. You wouldn't know, but the shoes have a stain on the inward-facing exterior from where I dropped a frappe latte on my feet, and the trousers have grazed knees from when I slipped over on some ice walking down a hill from university about 2 years ago. Of course, like most people, I definitely get a buzz out of picking up a few new things here and there - but I always try to mix those new things in with my pre-existing wardrobe. Sometimes I feel a little pressurised to only feature new items on my blog, because if they're not current it means that if you see me wearing something you like, you can't easily go out and buy it - which makes me feel rather like I'm taunting you; 'Ohhh look at this beautiful jacket I love it so much... btw it's 3 years old so you'll never get it, soz guys' but I also feel like I should at least try and be a 'good example' (bit cringe) and not constantly wear head to toe new-in. It's not necessarily about being a good example, but about being honest. I always want to give an honest representation of my life, and this is it. Yes, I love getting my hands on new pieces when I can, but I also wear stained shoes and ripped leather trousers. I think there's quite a strong pressure to continuously wear new items and to not be an outfit repeater (if you got this Lizzie McGuire Movie reference award yourself 10 points) but there's really nothing wrong with recycling old pieces and wearing things again and again in different ways, and if you want to be an outfit repeater, you do it - I know I am! your outfits are always so classy and sleek, i love them! Your style is always my favorite to stare at and I love your outfits. Also those shoes are the prettiest color and need to add more color like that to my wardrobe. I realy like your style! It is always good to mix and match new and old things alike. I always get great ideas from you! I do not need to buy similar staff as yours but when I like something from your outfits I try to find a look-alike. So, do not worry and it is good not to buy new staff all the time. I think is so much clever to match old clothes with a few new, rather than to buy new clothes all the time to show us which is not only overwelming for you but for us as well! !